Ve Neill, one of the main makeup artists for the Hunger Games movie series, has given a new interview with EW talking about her current work on the Mockingjay films. 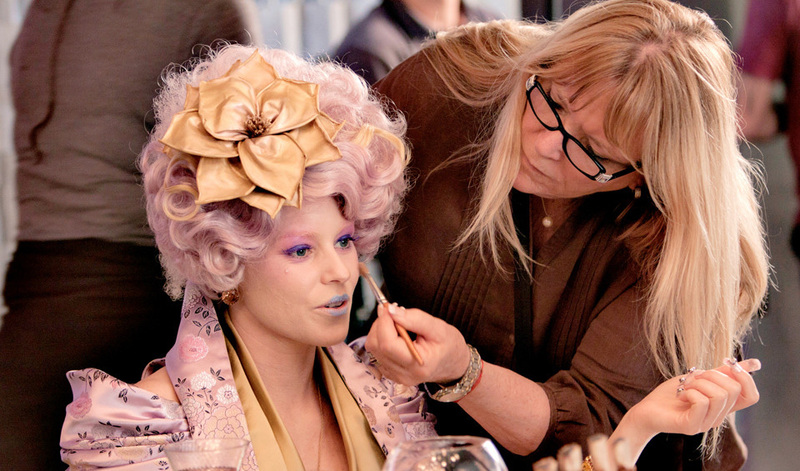 What’s next in the Hunger Games movies and how do you help tell the story through makeup? We’re going into the third book, which is when they go to war. You’re going to see a lot more wartime stuff. They’re going to go into district 13, which we’ve never seen and nobody thought existed. These people have been living underground, so you’re going to see a lot of that. Everybody is pretty plain. There’s not a lot of exotic looking stuff in the third movie. In the fourth movie, we go into The Capitol again and you’ll start to see some crazy stuff there. We’re really going for it on the fourth one. Part one is a wartime movie and we have four huge “prosthetic days” that include a hospital full of injured people who have just come in from bombings. They’re burned and missing limbs. We have a lot of distressed looking makeups as opposed to glamour. How big is the part of the Hunger Games makeup department that you oversee? We have three makeup artists who are on all the time and we have one make-up artist who runs our tech unit, who works with us concurrently doing interior and pickup shots. She sometimes has fifteen people working with her. Right now we’re doing stuff in District 13, so we have 20 extra makeup artists, and there are even more people in the hair department. We have a lot manpower because there are over 400 extras. They live underground, so nobody has tans. Everybody has to look sickly. Those are the types of makeups we’re doing — very simple, really pale. What’s it like working with the stars of the movie? They’re all wonderful to work with. They all have children… well Josh and Jennifer don’t, but a lot of our other adult principals have children and, of course, their kids are all really happy that their parents are working on the Hunger Games, so that’s fun for them. We have a terrific director and we don’t work hellacious hours. No 19-hour shoot days. They try to keep it to 12 hours so that everybody stays relatively healthy and rested. Though you might have less work to do if the extras came to set already looking a little sickly. We’ll just make ‘em look that way.